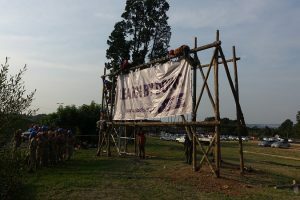 SSA: Why did you decide to help with building the new billboard to promote Scouting? SSA: What do you hope it achieves? I hope it advertises Scouts and leads young kids away from teenage temptation by joining the movement. SSA: What did you enjoy the most? Building the structure with friends and Scouts I had never met and watching the banner go up. SSA: Did you learn a new skill on the day by building the construction? Yes I learnt how to lead scouts that aren’t in my Troop. SSA: What is the coolest skill you have ever learnt through Scouting? How to build major pioneering construction with nothing but poles and ropes. 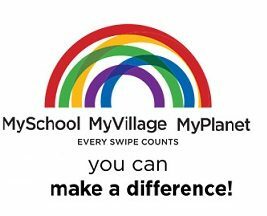 SSA: Why should your peers join the Movement? To learn life skills they cannot learn in school. 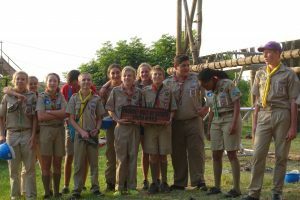 SSA: Can you give us one of your most favorite Scouting memories and tell us why it’s so special? I remember walking through the gate and ringing the bell when completing PLTU, our senior Scout leadership course. This was memorable because it showed that I had achieved something great and was able to walk in the footsteps of the people I look up to in Scouting. We would like to give a big Scouting Bravo to Randburg Scouting District Commissioner Ryan De Jager and all the Scouts and Scouters involved: 1st Randburg Scouts Duncan Stoltz, Connor Crickmore-Thompson and Lance Huddy; 1st Bryanston Scouts Simon Pienaar, Christopher Van Oerle and Victoria van Oerle; 1st Craighall Scouts Michael Bothma, Melissa Schaffrath and Fabian di Giandomenico; 1st Robin Hills Scouts Shane van Onselen, Sian van Onselen, Rocio Resola and Talita Mekgwe. 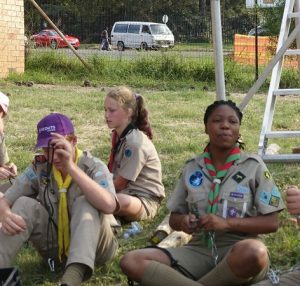 The Scouters present were Michelle Strydom and Garth Crickmore-Thompson from the 1st Randburg Scout Group.